Matrix TV remote codes. If you need the remote codes for your Matrix TV to control it with a universal remote control, these codes will operate your Matrix TV. We have 3 and 4 digit codes below for your TV that are working. If the first does not work keep trying the codes down the list. 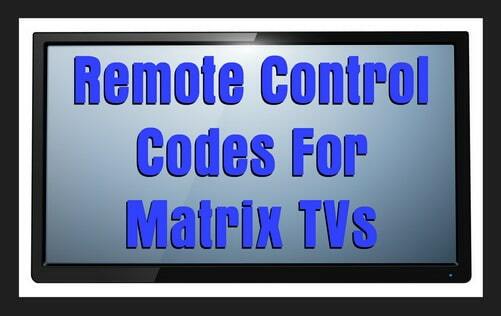 Need help with more Matrix remote codes or setting up your remote with your Matrix TV? Please leave a comment below. Do you have any code to my matrix t.v model 3280 i buy universal remote brand huayu but its not working Do u have any suggestion Ty..
Do you have any recommendations on what universal remote brand works best with Matrix LED TVs? theres no code available for matrix. Can you please help me?what are the codes usually used for universal- matrix remote control. I hope you can help me on this matter. How can i setup the remote if i cant open my tv? My power button wont work. What do you mean by “Can’t open TV”? Are you referring to the power button on your TV or on the Remote Control?